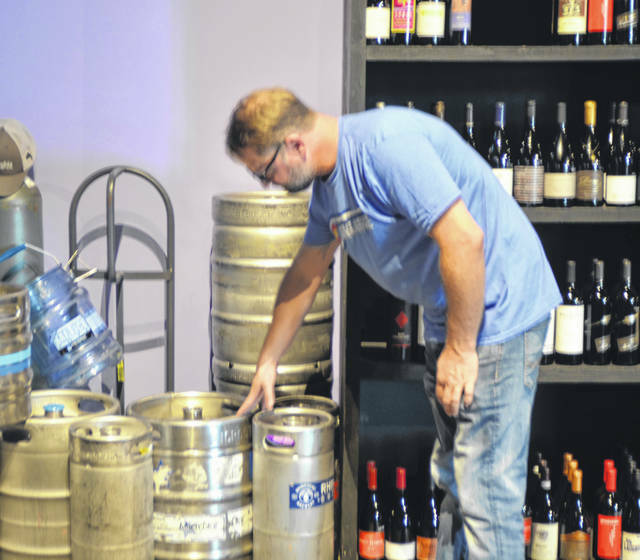 Marc Reinicke, owner of Vino Bellissimo on 2412 Cable Court, discusses the impact that the 10 percent tariff on alumium will have on beer can production. Marc Reinicke, owner of Vino Bellissimo on 2412 Cable Court, discusses the impact that the 10 percent aluminum tariff will have on keg production. LIMA — President Donald Trump’s recently imposed 10 percent aluminum and 25 percent steel tariff will not only have a negative impact on beer production but also could affect breweries, bars and consumers. The tariff on imports from Canada, Mexico and the European Union was imposed by President Trump in March as a result of a perceived natural security threat on importation of steel and aluminum, Beer Institute CEO Jim McGreevy III said. This has had a adverse affect on beer production, as 40 percent of aluminum beer cans and bottles are made from aluminum imported from Canada, McGreevy said. Reinicke estimates that with the new tariff, a six-pack of beer that costs $6.99 will increase to $9.99. Nick Moeller, owner of Moeller Brew Barn, 8016 Marion Drive, Maria Stein, said that he does not foresee increasing his prices anytime soon, as he does not see the tariff having a tremendous impact on his business. According to his beer can suppliers, prices will increase approximately one to two cents per can. Right now his business brews approximately 150,000 cans a year, which would increase the costs by $1,500 to $3,000 per year. Aaron Holtz, a Wapakoneta native and owner of Municipal Brew Works, 20 High St., Hamilton, said that he too does not envision increasing his prices. He has no intention on raising his prices because his keg supplier indicated it does not plan to raise prices just yet. In addition to the tariffs, there is the Midwest Premium, a shipping and handling fee for producers to get their metal from the shipping facility to the next user, McGreevy said. There has been a 135 percent increase of the Midwest Premium since January 2018, and there is an estimated 350 estimated tax imposed on American brewers, McGreevy said. McGreevy has reached out to Congress and the Trump administration about the concerns regarding the tariffs and Midwest Premium. On June 18, 32 members of Congress, including Ohio Representatives Jim Jordan, Bob Gibbs and Joyce Beatty, sent a letter to Attorney General Jeff Sessions about how to set a price regularity for the Midwest Premium. “I think that people understand that there may be a problem that needs to be addressed, but a lot of members of Congress think that the solution to the 10 percent tax on aluminum was not the right one, and we certainly agree with that,” McGreevy said. Despite the tariff and irregularities associated with the Midwest Premium, McGreevy said the Beer Institute is appreciative of the Alcohol and Tobacco Tax and Trade Bureau’s excise tax that went into affect in December 2017. This $150 million tax savings provided many breweries with the opportunity to expand. “Brewers were going to add employees and create more innovative products, but a lot of those things were put on hold because of the tariff,” McGreevy said. There are approximately 6,000 breweries in the United States today, many of whom will have to decide how to deal with the estimated $347 million tariff tax, McGreevy said. Moeller acknowledged that this is a significant increase, but he is willing and able to absorb the increased costs through things like the excise tax. He is appreciative of the excise tax, which he said lowered the barrel prices from $7 to $3.50. He now saves $5,000 on his 1,500 barrel production. There are approximately 2.2 million Americans who work in the beer industry, with about 80,000 working in Ohio. McGreevy estimates up to 20,000 lost jobs in the beer industry due to the tariff. In the future, Moeller said he does not intend to increase the prices of his six-pack cans to retail because it is too difficult for him to raise the prices n a very competitive market. 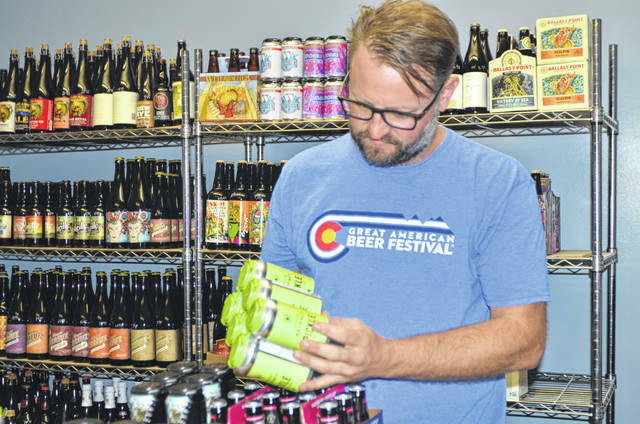 Reinicke does envision the tariff will create an adverse cycle, which will ultimately affect affect wine and craft beer bars like his. “Microstar Logistics, which is the No. 1 keg leaser to breweries, are going to raise their price. Breweries are going to have to raise their prices, and that will trickle down,” Reinicke said. If the supplier does decide to raise the price, Holtz said that there may be a subtle price change, as buying kegs is a one-time cost for the company, Holtz said. Reinicke acknowledged that money does not seem to be an issue for consumers right now, but that may change once the prices increase. https://www.limaohio.com/wp-content/uploads/sites/54/2018/07/web1_CJO_8820.jpgMarc Reinicke, owner of Vino Bellissimo on 2412 Cable Court, discusses the impact that the 10 percent tariff on alumium will have on beer can production. https://www.limaohio.com/wp-content/uploads/sites/54/2018/07/web1_Kegs.jpgMarc Reinicke, owner of Vino Bellissimo on 2412 Cable Court, discusses the impact that the 10 percent aluminum tariff will have on keg production.